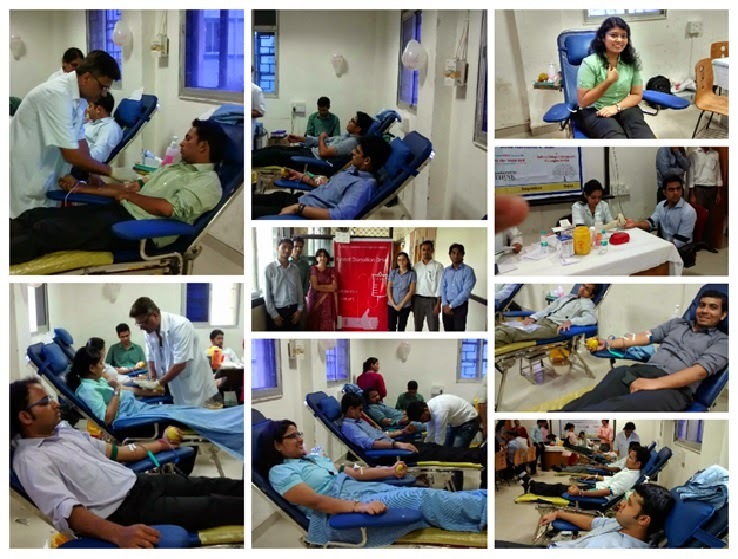 SSR (Student Social Responsibility) Committee in association with Tata Memorial Hospital, Lions Club (Juhu) and Think Foundation organized a ‘Blood Donation Camp’ and ‘Thalassemia Checkup’ at SIMSREE on 26th August 2014. The event commenced with a very informative session about blood donation and Thalassemia by Mr. Vinay Shetty, Vice President of Think Foundation. Mr. Vinay has been responsible for running a structured program for testing for Thalassemia minor in colleges in Mumbai University, which has now spread to various corporate offices and residential areas. The session helped break myths about blood donation and educated the students about the importance of blood donation. It also had detailed information about Thalassemia and pointed out the importance of Thalassemia checkup for every individual. Think Foundation is trying to ensure that no child is born with Thalassemia major and the students were encouraged to check whether they were Thalassemia minors by conducting free tests. After the session, the blood donation campaign was carried out. The camp witnessed an enthusiastic participation of 89 people wherein 450 ml /bottle and 350 ml/bottle were contributed by male and female students respectively. People from outside the college were also allowed to participate in the camp. This camp spread the feeling of contentment among the students of SIMSREE as the message given out in the session was that every individual can save 3 lives. Also dual sided English and Marathi version badges of “I donated blood today (मी आज रक्तदान केले)” were distributed to spread awareness across everyone in the college and outside the campus. Each blood donor was thanked and given a token of appreciation for his/her contribution. The process was smooth and painless; thanks to the cooperation of nurses and friendly doctors. SSR Committee would finally like to thank Dr. Sangeeta Pandit (HOD, Finance, SIMSREE), who guided the committee throughout the process.